One devoted to Vishnu acquires (through reading this Mahabharata) that merit which is acquired by listening to the eighteen Puranas. There is no doubt in this. [Narada said]: Your inquiries were full and your studies were also well fulfilled, and there is no doubt that you have prepared a great and wonderful work, the Mahābhārata, which is full of all kinds of Vedic sequences elaborately explained. Śrī Nārada said: You have not actually broadcasted the sublime and spotless glories of the Personality of Godhead. That philosophy which does not satisfy the transcendental senses of the Lord is considered worthless. Although, great sage, you have very broadly described the four principles beginning with dharma, you have not described the glories of, Vāsudeva. Please, therefore, describe the almighty Lord’s activities which you have learned by your vast knowledge of the Vedas, for that will satisfy the hankerings of great learned men and at the same time mitigate the miseries of the masses of common people who are always suffering from material pangs. Indeed, there is no other way to get out of such miseries. This discrepancy in the timeline of compilation of the Mahabharata and the Srimad Bhagavatam has been often used by Shaktas to claim that Devi Bhagavatam is the true Bhagavata Purana and not the Bhagavatam dedicated to Krishna. So does it prove the Shakta claim of Srimad Bhagavatam being inauthentic? If not, what is the possible reason for this discrepancy? The great sage Vyāsadeva, after compiling the Śrīmad-Bhāgavatam and revising it, taught it to his own son, Śrī Śukadeva Gosvāmī, who was already engaged in self-realization. Vishwanath Chakravarty Thakur comments as follows in his Sarartha Darshini. First Vyäsa had made an abbreviated scripture about bhakti, but on the advice of Närada, he rearranged it (anukramya), purified it, giving most prominence to bhakti to Kåñëa. It is understood that before the beginning of Kali-yuga he would not have been dissatisfied in heart. Now at this time, he revised the Bhägavatam which was previously written. When it is said kåsëe svadhämopagate, ... puräëo ’rkto ’dhunotditaù (SB 1.3.43), this refers to the revised Bhägavatam, the present one. When it is said that the present Bhägavatam is another Bhägavatam and that the Bhägavatam is among the eighteen Puräëas, it refers to the same Bhägavatam, the present one... Nivåtti-niratam means that Sukadeva had realized brahman. Another way to understand is that a purana is to be determined by its characteristics not exactly differences in the times of compilations. If indeed time difference is a valid criteria, on critical analysis many puranas have to thrown out of the list of eighteen puranas. Agni Purana: The 381st chapter of Agni Purana contains many Bhagavad Gita verses. Such a critical analysis may throw many puranas out of list of 18 puranas. Hence, the characteristics of Bhagavatam found in other puranas should be the real criteria, not the exact time when it is written. 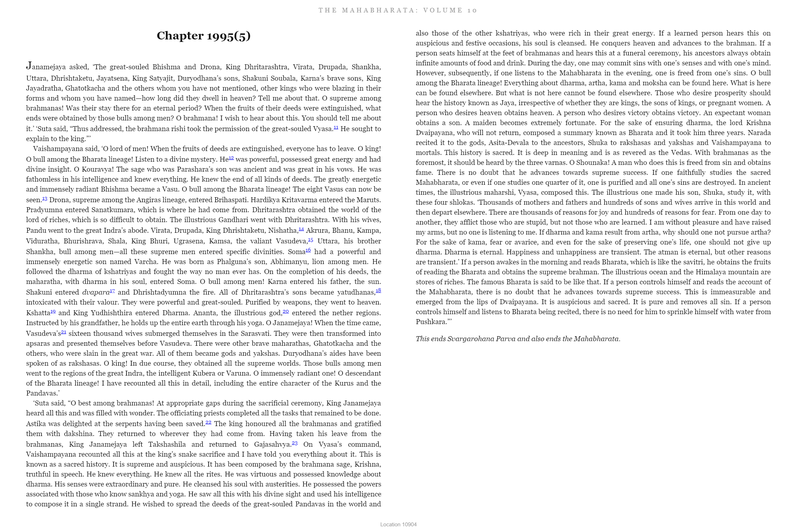 ...is not present in the Critical Edition (CE) of the Mahābhārata. In the CE, the Svargārohaṇika Parva ends with Chapter 5, whereas, the translation you are quoting is K. M. Ganguli's from here that belongs to Chapter 6. So, the rest of the argument doesn't hold any weight. Not the answer you're looking for? Browse other questions tagged mahabharata bhagavata-purana vyasa devi-bhagavata-purana . The Mahabharata we have today belongs to which Kalpa?